The cost of Manual Handling injuries & how Manual Handling Regulations affect you. What is Manual Handling? Manual Handling relates to the moving of items either by lifting, lowering, carrying, pushing or pulling. Incorrect manual handling is one of the most common causes of injury at work. Work-related musculoskeletal disorders (MSDs) such as back pain, limb & joint pain and repetitive strain injuries, account for over a third of all workplace injuries. “Manual Handling” is defined as the transporting or supporting of a load (including lifting, putting down, pushing, pulling, carrying or moving) by hand or by bodily force. The term “Load” is not limited to inanimate objects – it includes people (and animals). Manual handling injuries are not solely caused by lifting or pulling something that is very heavy. Injuries may be caused by the number of times (repetition) you have to lift or carry an item, the distance it is carried, the height you are picking it up from or putting it down at (e.g. picking it up from the floor, or putting it on a shelf above shoulder level) and any twisting, bending, stretching or other awkward posture you may adopt whilst performing the task. Manual handling injuries can happen anywhere where people are at work. On building sites, farms, factories, offices, warehouses, hospitals, banks, laboratories, and while making deliveries. Heavy manual labour, awkward postures, and previous or existing injuries are all likely to increase the risk of injury and result in a musculoskeletal disorder (MSD). Work related manual handling injuries can have serious implications for both the employer and the person who has been injured. Employers may have to bear substantial costs, through lost production, sickness absence, wages/overtime & retraining to cover for the absent person, and potentially compensation payments. The injured person may find that their ability to do their job is affected and there may be an impact on their lifestyle, leisure activities, ability to sleep and future job prospects. The total number of MSD cases in 2013/14 was 526,000 out of a total 1,241,000 for all work-related illnesses. Activities in specialised construction, agriculture, postal and courier and health care had higher rates of total cases of MSDs compared to the average across industries. Building trades, nurses, personal care and skilled agriculture trades had higher rates of total cases of MSDs compared to the average across all occupations. Source: the Labour Force Survey (LFS) and Health and Safety Executive (HSE). How do the Manual Handling Regulations affect you? There are several pieces of legislation relating to musculoskeletal disorders, which attach responsibilities to both employers and employees. The main legal responsibility for employers is to protect the health and safety of their employees and other people who might be affected by what they do, as required by the Health and Safety at Work etc Act 1974. As well as the requirements for a general risk assessment, there is a requirement in the Manual Handling Operations Regulations 1992 (as amended) to carry out a risk assessment on manual handling tasks. The main areas to focus on are the task, load, working environment and individual capability. 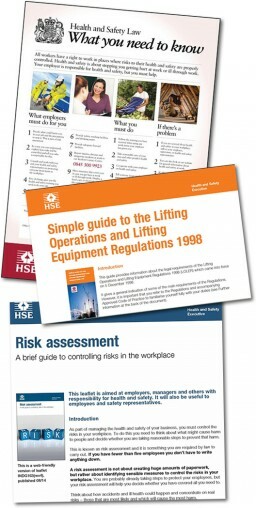 The HSE and local authorities are responsible for enforcing health and safety legislation. Each has a range of tools at their disposal in seeking to secure compliance with the law and ensure a proportionate response to offences. For more serious offences, inspectors may serve improvement notices and prohibition notices and they may prosecute (or in Scotland, report to the Procurator Fiscal with a view to prosecution). HSE prosecuted 582 cases, with at least one conviction secured in 547 cases (94%). local authorities prosecuted 92 cases, with at least one conviction achieved in 89 cases (97%). 13,790 notices were issued by HSE and local authorities. An employer should conduct regular risk assessments, provide your employees with regular training and provide suitable equipment to minimise staff engagement with manual handling activities. Avoid hazardous manual handling operations. Make suitable and sufficient assessment of risks. Reduce risk to lowest reasonably practicable level. Provide general info, or precise information where reasonably practicable, on the weight and distribution of the load. Take reasonable care of their own health and safety and that of their colleagues and clients. Use available equipment in accordance with the training and instruction provided. Follow the specified systems of work. Use proper channels to inform management of accidents or possible hazards. We have a page with more specific information related to The Manual Handling Operations Regulations 1992. We have a page of Frequently Asked Questions related to Manual Handling and the courses that we offer. The Health and Safety Executive (HSE) website is an excellent source of information and advice on MSDs and manual handling information and advice, including advice on managing back pain at work. Taking the actions described here will help prevent some injuries and is likely to be cost effective, but you can’t prevent all MSDs, so it is essential to encourage early reporting of symptoms and essential that employers manage the risks to their employees. If possible you should not carry out any manual handling tasks. Where these are necessary you should mitigate the risk by using equipment – trollies, pallet trucks, fork lift trucks etc. Where tasks are essential and cannot be done using lifting equipment, a suitable and sufficient risk assessment should be conducted in conjunction with professional training and a regular training refreshment & risk re-assessment schedule.